DnBuster's Place: SendaBall!~ What a GREAT Gift! The mail man delivered such a great gift right to my front door! It was a bright red ball! I am a member of Question Moms and it was a surprise gift from them! This is such a unique and cute idea! SendaBall~is a family business headquartered in Chicago. It is owned by a couple of BALLSY sisters who live across the street from each other in the same northwestside Chicago neighborhood they grew up in. 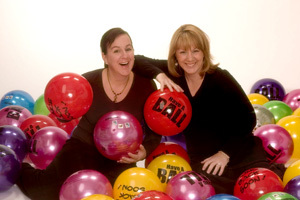 They have been sending balls since the 90s, but one day in 2003, it seemed this CRAZY idea was meant to be a BUSINESS. You can personalize the ball for just about anything! Why send a basic card or flowers when ya can send a ball! It comes already inflated with your message and is ready to play with and provides many hours of fun play time (just ask my kiddos) they haven't put it down yet! SendaBall costs $16 plus shipping ($4 in most cases). You can personalize the message, pick a color, etc at www.sendaball.com. Sendaball has offered the readers of Dnbuster's Place a coupon code good for $3 off any SendaBall of their choice. Please enter Question597 at checkout. Thanks to questionMoms and sendaBall! I received no other compensation other than the ball for the review. Greeting Cards made from a bouncy ball; Greeting Ball shipped in the mail. What a cute idea, I will have to check them out. Balls are a favorite with my grandkids. Welcome to VoiceBoks BTW. I look forward to getting to know you. What a great idea! Thumbs up for people with innovation and who dare! that's certainly unique. I bet no one I'd ever send that to would have ever gotten anything like that. Thanks for covering them! I found you on Voice Boks. This is one of the cases when you wish you came up with it too! Awesome idea. I'm going to do this!!! What a great idea! It looks like so much fun!